Many of us have likely learned to view the world through cynical glasses. "You don't trust anyone,"my lovely wife has told me. I take it as a compliment. When it comes to new, ghee-whiz gadgets or technologies a lot of cops have the knee-jerk — it won't work — reaction and when the subject of red dot or electronic optics comes up, I've heard a loud refrain of skepticism. "When I need it, the batteries will be dead" or "I won't bet my life on something that uses batteries" are two of the most popular arguments against red dot sights. The other big one is, "you can't do anything with a dot scope you can't do with iron sights." I have been using red dot electronic optics from various manufacturers for several years now. As with any product, each company has their own twist on the idea. The basic concept behind the red dot optic is to give the shooter a highly visible aiming/reference point for rapid target acquisition. The T1 was designed to incorporate positive features of larger optics in a more compact package. It only weighs only 4 oz and like their popular CompM2 it operates on a single 3V Lithium battery. Straight from the factory, the T1 mounts to any Mil-STD 1913 Rail. Thanks to the use of 21st Century technology, the Micro T1 red dot sight has a run time of an amazing 50,000 hours. You install the battery, find the dot intensity you like and leave it there. After four to five years you'll need to install a fresh battery. The Micro T1 has 13 settings for dot intensity; six for use with night vision and seven for low, normal and bright light. Zeroing is accomplished with windage and elevation knobs. They even had the foresight to build in an adjustment tool so you don't need a penny or dime to turn the knobs. The T1 comes standard with a MIL-STD 1913 low mount. La Rue Tactical makes a quick-detach high mount that works very well allowing for co-witnessing the T1 with the iron sights on the flat-top M4/AR. 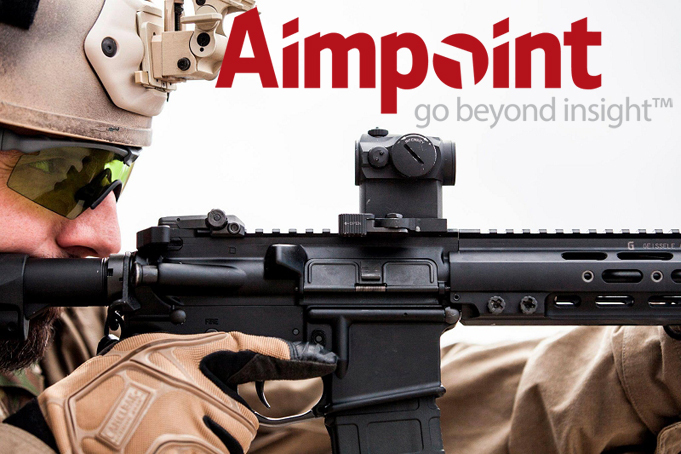 Real World Durability Aimpoint's durability is legend among military personnel. A friend related an incident during a rapid insertion. He was thrown from his vehicle and ended up on his back with his CompM2 equipped M4 underneath him. He hit so hard he initially feared the carbine's barrel might have been bent. You can't call time out in the middle of a mission; he got up, checked his gear, and drove on completing the team's assignment. Not only did the Aimpoint still work fine, it didn't even lose its zero. 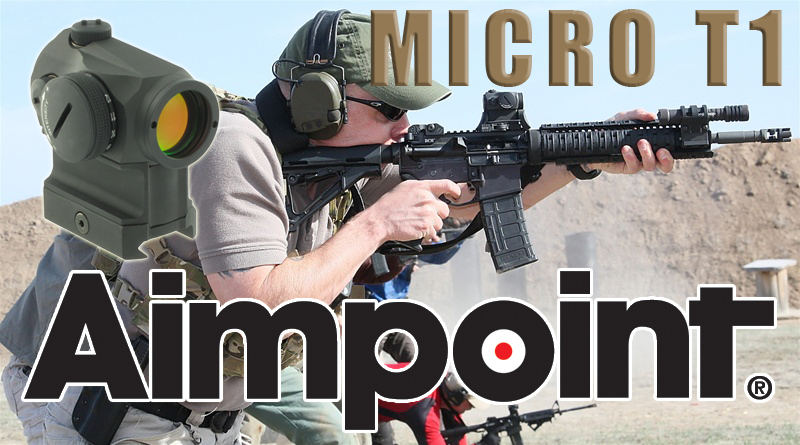 Freddie Blish of Aimpoint demonstrates the T1 by zeroing it, removing it from the gun and tossing it across the room. Gasps are heard from the audience as the sight bounces on the concrete floor. With the LaRue Tactical High Mounted on a Vang Comp Remington 870, allows for a high cheek weld and for co-witnessing with iron sights on a flat-top AR. He'll mount it back on the rifle and show you the unit works and zero hasn't been lost. That's tough. If the worst happened and your battery did die or the optic quit, you could still make accurate shots on target by simply sighting through the tube. You can also flip up you iron sights. And, as for relying on something manmade to save your life; don't forget the rifle, subgun, or shotgun your sight is mounted to was made by the hands of men.